Beautifully engraved SPECIMEN certificate from the Huntington Hotel Company dated 1936. 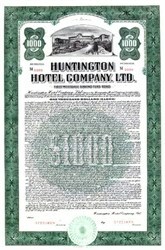 This historic document was printed by the Jeffries Banknote Company and has an ornate border around it with a vignette of a full-scale view of the Huntington Hotel property. This item is over 78 years old. This is the only example of this certificate we have seen. The original hotel on the site was built in 1907 by General Wentworth, a Civil War veteran, and designed by Charles Frederick Whittlesey in Spanish Mission Revival-style. It opened in February 1907 as the Hotel Wentworth, but closed its doors after its first season. It was purchased by Henry E. Huntington in 1911 and reopened in 1914 as The Huntington Hotel after redesign by the architect Myron Hunt. It remained under Huntington's management until 1918. California's first outdoor Olympic-size swimming pool was added to the hotel in 1926, when the hotel, formerly a winter resort, began opening year-round. The hotel was later owned by Stephen W. Royce, who sold it to the Sheraton Corporation in 1954. It was subsequently renamed The Huntington Sheraton. The hotel closed in 1985 after the main building ceased to meet new earthquake codes, which had been changed due to the disastrous 1985 Mexico City earthquake. It sat vacant until it was demolished in 1988, though the bungalows remained in operation as a hotel. During the demolition, the two historic ballrooms, the Viennese Ballroom and the Georgian Ballroom were retained and incorporated into the new hotel. In addition, the outbuildings such as the pool, lanai and bungalows did not need to be demolished. A new building, almost exactly replicating the original, opened in March 1991 as the 383-room Ritz-Carlton, Huntington Hotel. It was renamed The Ritz-Carlton, Huntington Hotel & Spa in April 1998. The end of 2007 the hotel changed hands and re-opened in January 8, 2008 managed by Langham Hotels International. History from Wikipedia and OldCompany.com.